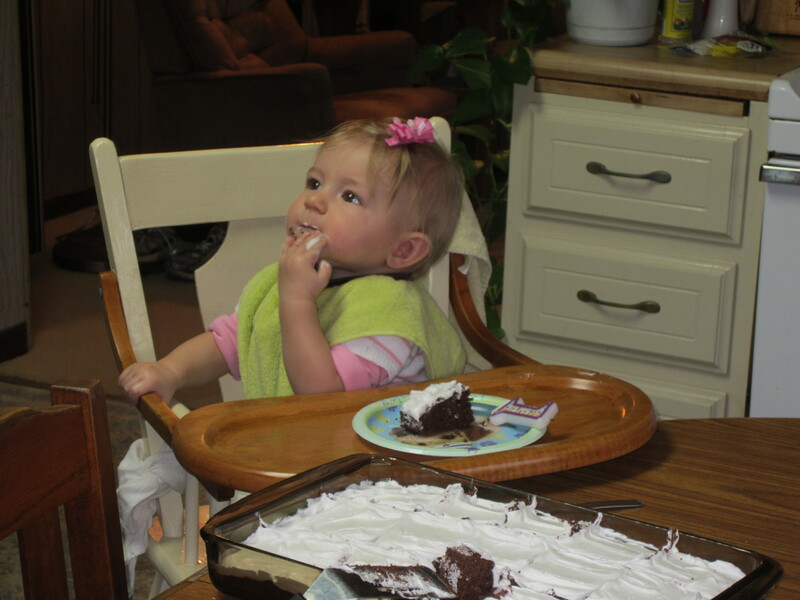 Oh man, my little girl is 1 today. Not sure how I feel about that. I’m excited, sure, but a whole year has past? It feels more like a lifetime, and in some ways, like no time has past at all. The baby weight hasn’t come off completely. A year ago, that would have surprised me. Today, not so much. Losing baby weight, especially while breastfeeding, is different for everyone (or so I’ve learned). I’m unfortunately not one of those speed baby-weight losers. I have, however, lost 4/5 of what I gained while pregnant. So I’m happy to say that, at least. 1700 calories a day, with a 60% good carbs, 20% protein, and 20% fat balance. Or…that’s what I was aiming for. I can’t say it always happened. There were times I had to bump up the fat for breastfeeding purposes. And when I was burning more than 2500 calories a day, I went up to eating 2000 calories. My BodyMedia armband and food log really helped with that (if you’d like, read my BodyMedia Armband Review for more information). Ginny is clapping. She just started the other day, and it’s adorable. Funny how the little things…like baby clapping, or stepping away from the table for just a split second, or saying mamama and sort of meaning it…these little miracles make motherhood amazing. This morning, I said happy birthday to my little girl and gave her an Eskimo kiss (remember “ug-a-ma-ga” from Mr. Roger’s Neighborhood anyone?). I guess I never thought to do that before. That’s where you rub noses, and Ginny loved it. I mean, at first she just stared at me like, “what are you doing mom?” but then she caught on. She gives me that look a lot. A whole year. Can you believe it? Can you tell that I can’t? 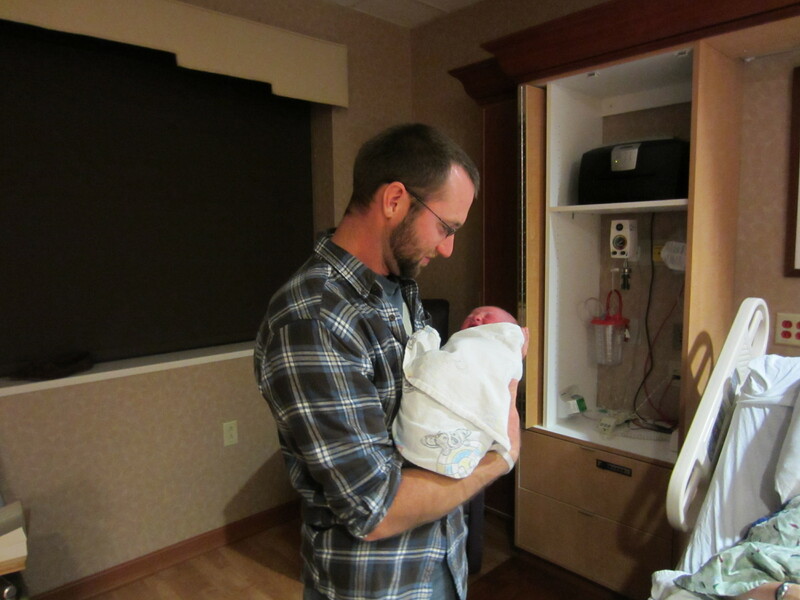 I never put my birthing story on this blog, and I probably never will go into all the details. I guess I would like to say that it wasn’t “normal,” but then, what birthing story is? 2 months of sort of bed rest because I was having light contractions pretty consistently, then about 3 hours of labor…if that. I was in the hospital bed for a total of 7 minutes before Ginny was born. Then, ta da! I like to chalk it up to all the abdominal workouts those 2 months of contractions provided. My body was is shape to get that baby out fast. I really wanted to have a drug-free childbirth, and I’m happy to say that I pulled it off. I’m not waving some flag that says “I’m better than you because I went natural.” I just did a lot of reading and came to my own personal conclusion that medical intervention is great, when necessary. And I wanted to avoid it, if I could. I didn’t always feel that way. In fact, I thought skipping the epidural was a crazy, and very scary idea. I blame that on our culture. We make childbirth out to be this horrible thing. It’s woman’s punishment for Eve taking the first bite of the apple. Why would you want to experience it with a clear head? How about we drug you up so you can get through this horrible thing? That wasn’t my experience at all. Honestly, I remember giving birth in a very happy light. The aftermath wasn’t so fun (stitches and the such), but when Ginny showed up in this world…that was such a wonderful moment for me. She was so little, and red. She looked like a little Native American. And Thomas was so proud and happy. And I was proud and happy. And Ginny…well, she was mostly just upset. What changed my mind on the whole drug-free vs. medical intervention thing? My baby guru, Kristina, had given birth 4 times without drugs (now 5), and at first, I thought she was a little screwy. But she lent me her Bradley Method book (Husband-Coached Childbirth: The Bradley Method of Natural Childbirth) when she came over to talk about cloth diapers. That was quite brilliant, because she didn’t push me on the subject. She just handed me the book and said, “Read this if you want.” I got curious. Once I started reading it, my mind slowly warmed to the idea. By the time I was done, I had convinced Thomas to be my “coach,” (which is really just a really supportive husband with a lot of pressure to not be overbearing but to keep you in mind of your own goals). We were really both on board, at least to the extent that epidurals and the like were tools in our toolbox that we’d really rather not use. My mom gave birth 7 times. She had an epidural for all but 1 (which was her 2nd), and she went right back to the epidural for the next 5 babies. So natural isn’t for everybody. I don’t think anyone thinks my mom is any less of a mother, or waving their “natural childbirth” flag in her face. How you have a baby is totally up to you. What scares me (and I feel the need to write about this) is the ever-growing amount of c-sections in our country. And it seems that once you jump head first into the medical intervention world of childbirth, you’re on a fast track for a c-section. Or, at least, it’s more likely to happen. I realize that’s an opinion, and a lot of people would disagree with me, but the more I looked into it, the more I found that the vast majority of people who ended up with c-sections started right out with an epidural or being induced or some other medical intervention. I’m guessing that a lot of that has to do with a woman’s mindset. If you’re already giving all the control over the doctors, and they suggest a c-section even when it’s just an option and isn’t necessary yet, you’re probably going to say yes. For more on the risks and dangers of c-sections (from a surprisingly light-hearted point of view), read Why You Don’t Want a C-Section. Sorry about the baby-birthing train, for those of you who aren’t interested in this sort of thing (though, I suppose you’ve stopped reading this by now if you fall into that category). I know I have some readers (especially sisters) who may have babies some day, and I hope, dear readers, that you take all of this with a grain of salt and learn the one thing that really, really helped me have a wonderful birth experience a year ago today: I did the research. I went out there, and I dug through all the good and bad of childbirth advice. I talked to people…and some really upset me, and some I found incredibly supportive. If you find yourself pregnant one of these days (or know someone who is who could benefit from reading this), know this: this is your pregnancy. Do it your way. Excellent post, Kathleen. I really feel like there is a lot of dissatisfaction with how birth in our country goes down, and I love that there’s a conversation happening about it. For me, it boils down to one thing: Women have the right to be educated about birth, their options, and what those options mean. Unfortunately, my experience talking to friends tells me that this doesn’t always happen in the doc’s office. And I’m not blaming them–is it really their jobs? No, it’s ours. We should take ownership of our bodies and our experiences. We wouldn’t hire a painter and say “So, I want my house painted” and then leave. We’d share our preferences, our plans, and then take his expert opinion into consideration and make choices. Should be the same at the doctor’s office–for anything, but especially for birth, where it often is your choice whether you become a patient or a partner in your own care. If anyone is looking for more on this, this website is terrific: http://evidencebasedbirth.com/ It provides hard numbers and where the studies come from so you can make more informed choices. And as someone who had to dig into the toolbox more than I wanted during Eleanor’s birth–thank you for being respectful of those times when intervention makes sense. Thank you for that response Rowenna. I think that helped to tie things up well…especially the house painting analogy. And you know, I never thought about whether or not it’s a doctor’s job to encourage you to become informed outside of their office. If you’re a house painter, and someone says, “paint it,” and you say, “what color?” But all they have to say in return is, “I don’t care…just make it look good,” whose fault is it if it doesn’t turn out exactly the way they want it? And as for intervention making sense at times, it absolutely does. And that’s why the toolbox is there. I know your story personally, but I’d guess that if you’d handled that entire situation differently (using the medical intervention in the beginning as opposed to the end), things could have gotten really ugly. You were a real trooper, and you made informed decisions at ever step. When I first told my midwife that I wanted to use the Bradley Method, she looked at me carefully, and asked how I knew about it. When I explained that I read the book but hadn’t taken any classes, she took a deep breath of relief. Apparently, the classes can really push you to avoid medical intervention with very, very, very few exceptions…even when it’s just being stubborn. She gave me a couple of examples, and I gave her a couple of my own…situations where I realized medically intervening was important. We both left satisfied that I had a good idea of what I wanted, what tools were in my toolbox, and when to use them. Something I want to add…I’ve heard multiple times that if you think an epidural is an option, you’ll end up using it. I think that’s just plain silly. I mean, I guess if you want to go drug free simply to say you did it, or because you “heard” it’s better for the baby, well, then maybe. But if you’re really informed and you know how you feel about child birth and your options, you don’t lose your brain when you’re in labor. Well, you might for a couple of minutes here and there. Just tell your coach, husband, dula, or whatever that you’re not allowed to make big decisions while you’re contracting. Never once, in that hour long drive to the hospital, did I think, “I want to get there so I can get the drugs.” I just wanted to get there so that I didn’t have the baby in the car. Drugs never even crossed my mind, even though I viewed an epidural as an option in certain circumstances.